One of the most popular SWAC rivalry games – The Soul Bowl — will decide who advances to the Championship game. One of the most popular Southwestern Athletic Conference rivalry games – The Soul Bowl — will decide who will represent the SWAC East in the 2018 SWAC Championship game. Alcorn State (7-3, 5-1) has been no stranger to SWAC title appearances as the Braves have made four consecutive trips to the conference title game since 2014. 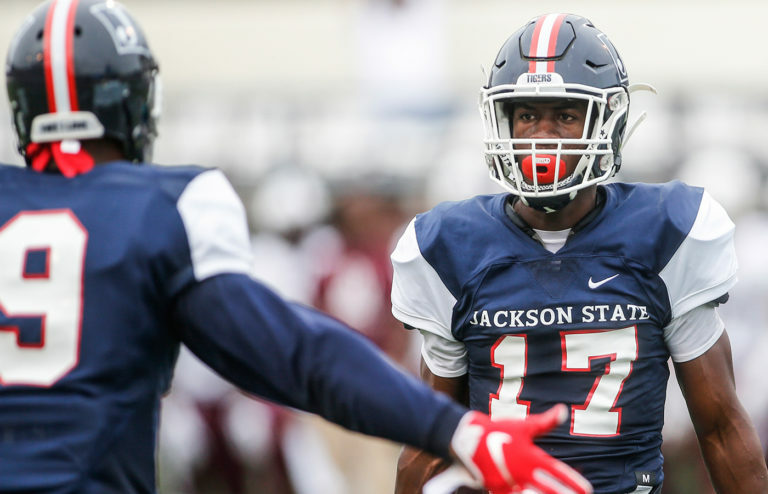 Meanwhile, Jackson State (5-4, 4-2) will look to earn a spot in the championship game for the first time since 2013 when the Tigers lost to Southern University 34-27. Both teams have a case as to why they should represent the SWAC East in the conference title game. The Braves enter the game ranked first in the conference in scoring offense (34.1 points per game), total offense (479 yards per game) (12th in FCS), total defense (allowing 292.2 ypg) (ninth in FCS), rush offense (280 ypg) (eighth in FCS) and rush defense (allowing 93 ypg). In categories where they are not atop the conference statistically, the Braves rank second in scoring defense (22.4 ppg), sixth in pass offense (199 ypg) and fourth in pass defense (198.9 ypg). Alcorn also ranks first in the number of first downs earned in games (averaging 23.2), first in limiting opponents first downs (16.8), third in third-down offense and second in third-down defense. QB – Noah Johnson (FCS Walter Payton Award Watch List): Johnson has thrown for 1,767 yards and 14 touchdowns and eight interceptions and rushed for 802 yards and seven touchdowns. Johnson sits third in the conference in passing yards, sits as the second-leading rusher for the Braves and second in total offense in the SWAC. RB – De’Shawn Waller: Waller has rushed for 747 yards and nine touchdowns, averaging 106.7 yards per game and 5.7 yards per carry. Waller leads the team in rushing and sits second in the conference in rushing yards. RB – P.J. Simmons: Simmons has rushed for 645 yards and three touchdowns, averaging 64.5 yards per game. RB – Marquise Forman: Forman has rushed for 264 yards and two touchdowns. WR – Raidarious Anderson: Anderson leads the Braves in receiving yards with 459 on 28 catches for three touchdowns. Anderson ranks sixth in the SWAC in receiving yards and averages 16.4 yards per catch. WR – Chris Blair: Blair sits second in receiving yards for the Braves with 35 catches for 457 and six touchdowns (leads the team in receiving touchdowns). Blair averages 13.1 yards per catch and ranks seventh in receiving in the conference. WR – Dayall Harris: Harris has recorded 356 yards on 20 catches for four touchdowns. Harris leads the team in yards per catch (17.8). DB – Javen Morrison: Morrison ranks second in kick return yards with 266 yards on 12 returns, averaging 22.2 yards per game. He also ranks third in the SWAC in pass breakups (7) and has recorded three interceptions. DB – Brady Smith: Smith has recorded five pass breakups and an interception. K – Corey McCullough: McCullough is 12-of-20 in field goals this season with this longest being for 46 yards. DB – Qwynnterrio Cole: Cole leads the Braves in tackles with 57 with 32 solo, three pass breakups and three interceptions. LB – Solomon Muhammad: Muhammad has recorded 44 tackles with 18 solo, 6.5 tackles for a loss and four sacks. LB – Terry Whittington: Whittington has recorded 40 tackles with 16 solo. He ranks sixth in the conference in tackles for a loss (10) and first in sacks with seven. DL – Sterling Shippy: Shippy sits fourth in the SWAC in tackles for a loss (11.5), fourth in sacks with six and two forced fumbles. DL – Kwanzi Jackson: Jackson has recorded seven tackles for a loss and four sacks. LB – Trae Ferrell: Ferrell has recorded seven tackles for a loss and 5.5 sacks. LB – Brelion Hollis: Hollis has recorded six tackles for a loss, two sacks and two forced fumbles. DL – Darrell Henderson: Henderson has recorded 4.5 tackles for a loss, three sacks and two forced fumbles. The Tigers enter the game ranked ninth in scoring offense (18 ppg), fifth in scoring defense (24.6 ppg), eighth in total offense (285.7 ypg), second in total defense (349.4 ypg), seventh in rush offense (120.7 ypg), second in rush defense (136.7 ypg) and allowing opponents first downs (19.4), eighth in pass offense (165.0 ypg) and sixth in pass defense (212.8 ypg). Special teams have also been a solid spot for JSU as the Tigers are first in field goals behind the play of kicker Christian Jacquemin. RB – Jordan Johnson: Johnson leads the team in rushing yards with 528 on 94 carries for three touchdowns, averaging 5.6 yards per carry. Johnson ranks fifth in the SWAC in rushing yards and 11th in all-purpose yards. RB – Keshawn Harper: Harper has tallied 285 yards on 55 carries for two touchdowns, averaging 5.2 yards per carry. RB – Quitten Brown: Brown has recorded 210 yards on 59 carries for two touchdowns, averaging 3.6 yards per carry. RB – Juavon Brown: Brown has rushed for 75 yards on 16 carries, averaging 4.7 yards per carry. QB – Jarrad Hayes: Hayes has thrown for 744 yards, six touchdowns and three interceptions. WR – Warren Newman: Newman leads the Tigers in receiving yards with 219 on 21 catches and one touchdown, averaging 10.4 yards per catch. WR – Romello Shumake: Shumake has tallied 148 yards on 12 catches for two touchdowns, averaging 12.3 yards per catch. K – Christian Jacquemin: Jacquemin leads the SWAC in made field goals, going 15-of-17 this season. LB – Keontre Hampton: Hampton leads the Tigers in tackles this season with 74 with 40 assisted, 1.5 sacks and ranks 13th in the SWAC in tackles for a loss. LB – Darrius Woods: Woods has recorded 52 tackles with 32 assisted. DE – Khalil Johnson: Johnson has recorded 37 tackles with 18 assisted and three sacks, leading the team in sacks. LB – Eric Bowie: Bowie has recorded 29 tackles with 12 assisted. Bowie also has broken up four passes. CB – CJ Holmes: Holmes ranks second in pass defended with nine breakups and two interceptions. CB – Ryan Theyard: Theyard has broken up one pass and recorded two interceptions. Panthers will have a new coach for spring practice.